On October 29, 1900, Indiana Fletcher Williams died, leaving her 8,000-acre plantation estate and almost $1 million to create the Sweet Briar Institute. Later renamed Sweet Briar College, it was founded by Williams to honor her daughter, Maria Georgiana "Daisy" Williams, who died tragically in 1884 at age 16. For over a century, Sweet Briar has recruited dedicated faculty and staff to teach exceptional students. The school's award-winning lands include old-growth forests, rare arboreal and floral species, scenic hiking and riding trails, and two lakes. Complementing these natural resources are beautiful campus buildings, many of which are listed in national and state historic registers. Each of these features is rare for a college campus; taken together, they compose the rich physical and community heritage of a historic college that celebrates its 115th birthday in 2016. 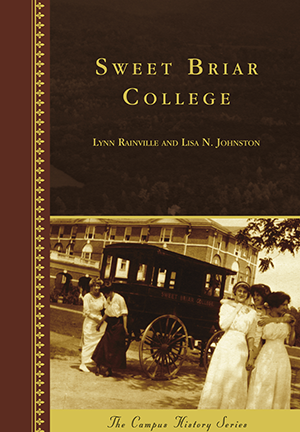 Dr. Lynn Rainville taught at Sweet Briar College for 15 years. In 2008, she was appointed director of the Tusculum Institute and research professor in the humanities. Lisa N. Johnston was a librarian at Sweet Briar College's Mary Helen Cochran Library for 25 years. The majority of the photographs are provided courtesy of the Sweet Briar College Archives.